The area of Italian East Africa (officially called "Africa Orientale Italiana") was under its own united air command (commanded by General Pietro Pinna), which was however subdivided into three subordinate sectors which had a fair degree of tactical autonomy due to the relatively large territory involved. Total forces of the Italian Air Force (called "Regia Aeronautica") employed there amounted to nine bomber groups (1 SM79, 3 SM81, 5 Ca133) plus four independent bomber squadrons (Ca133), and four independent fighter squadrons (2 CR42, 2 CR32). The only significant air reinforcements reaching this theatre from Italy were 51 CR42 fighter planes transported there inside SM82’s. In June 1940 the British had only two brigades of regular troops in Kenya, but by the end of July there were five brigades, and soon afterwards three squadrons of South Africans equipped with Hurricane fighters also arrived there, providing a big advantage over the Italian CR42’s. By the start of Lieutenant-General William Platt’s offensive out of the Sudan into Eritrea in January 1941, the British in that sector had been reinforced by the 4th and 5th Indian Divisions, and they also had Hurricanes supplementing their Gladiator biplane fighters (not to mention the advantage of a small packet of the Matilda tanks, impervious to any Italian guns in the theatre). While the ground combat began in a somewhat dilatory manner, in sporadic fashion, and hardly at all until July, in the air both sides were active from the start, despite the relatively sparse resources available. On June 11th, the first day of the war, the Italians bombed Kassala in the Sudan, killing at least one civilian. The same day British Wellesley bombers struck the port of Massawa with great success, hitting a fuel dump and destroying 780 tons of aviation fuel. After this the Italians made efforts to better disperse their fuel dumps, but the British persisted in attacking them, albeit with less success. On June 12th British aircraft from Aden– three Blenheims– hit Eritrea’s other port, Assab, burning up some food supplies (macaroni and rice), of which the worst loss was 20,000 bottles of wine. That night the British returned to Assab, this time striking the airfield there and setting off a small cache of 3,000 rounds of machinegun ammo. On June 13th, at the other end of the theatre, the Italians exacted fitting retribution for the British success in striking the fuel dump at Massawa two days earlier. Three antique Ca-133 bombers attacked the airfield at Wajir in Kenya, setting ablaze 5,000 gallons of British aviation fuel. In the first week of the war the Italians also bombed Khartoum for the first time, causing more panic than damage, while in mid-month a formation of nine Wellesleys carried the war to Gondar in Ethiopia. Interception of the British bombers, especially the Blenheims, often proved difficult. These tended to operate in small groups, often no more than three at a time, and given the vast spaces comprising the theatre and the lack of any real early warning system, they were very successful at playing hit-and-run. Furthermore, I’ve read quotes by two different Italian fighter pilots in East Africa lamenting that their CR42 biplanes, the best available in the theatre, were too slow to catch the more modern British planes. Nonetheless, the British were also employing older, obsolescent types such as the Wellesley, and unescorted raids against the Eritrean Red Sea ports often paid a price to the fighter defenses. The Italian pilots, many of whom had prior combat experience in Spain, also did fairly well in operations directly supporting the ground forces, one of their chief missions. Captain Mario Visentini, the top-scoring Italian ace in East Africa, was credited with 16 victories before his death in a flying accident caused by bad weather during the battle of Keren in February 1941 (Arena, “La Regia Aeronautica”). On one occasion Visentini’s commander had been forced down behind enemy lines, but Visentini landed his own CR42 alongside him, squeezed the officer into the fighter’s cockpit, and took off again, returning both men safely to their own base. In August 1940 the British struck for the first time at Addis Ababa, which they had not even properly reconnoitered beforehand. Five Wellington bombers, staging from the British airfield on Perim Island, carried out the attack on the Ethiopian capital. One aircraft got separated and lost, but the other four managed to find their target, where they ran into surprisingly heavy antiaircraft fire which damaged all of them to some extent (and were also repeatedly attacked by a single persistent CR32 fighter), but claimed four SM79’s destroyed on the ground. All five planes managed to return to their base, the straggler after landing briefly at (by now theoretically neutral) Djibouti. This raid occurred on August 18th. I should also mention that the Italians made one attempt to interfere with the British evacuation of Berbera, also going on at this time, with an air attack, but did no damage. There were however a couple of small coups for the Italian air units in October 1940. On the 16th, a single SM79 bomber and seven CR32 and CR42 biplane fighters carried out a well-planned and -executed raid on the airfield at Gedaref (Sudan), where the British had assembled a small force of eight Wellesleys and two Vincents for the express purpose of providing air support to the Ethiopian guerrillas. The lone SM79 dropped its bombs squarely in the middle of the parked RAF aircraft, which were then subjected to repeated strafing runs by the fighters. When they departed, without loss, the Italians left all ten enemy planes burnt-out wrecks. And three days later, four SM82 trimotors (lumbering aircraft, used mainly as transports, but with greater range and payload than any contemporary Axis design) took off from the airfield of Rhodes in the Dodecanese, refueling in Eritrea, and in a night attack bombed oil installations on Bahrein, and then at Dharan in neutral Saudi Arabia. Though the damage inflicted was slight, the 2,800-mile round trip raid was an impressive accomplishment technically speaking. Piloting the lead plane of the quartet was Ettore Muti, who would be named the new Secretary of the Fascist Party eleven days later– that notorious “man of action” who claimed he stopped reading the newspapers when he was 15 (ironic since most of the top Fascists– including Mussolini, Farinacci, Balbo, Grandi, etc– were or had been themselves journalists. The Fascists were generally a media-savvy bunch who had early discovered the power of the press). This raid comprised part of a small stirring of offensive action by the Italians in East Africa, as the next night four destroyers of the small Italian Red Sea squadron sortied in an attempt to intercept a British convoy, which proved unsuccessful. The Italians also had one more significant advantage, the presence of more than forty aircraft at Gondar, within easy flying range (about 100 miles distant). The British, on the other hand, had only ten Gloster Gladiator biplane fighters (1st South African Squadron and the British “K” flight), and a slightly greater number of widely assorted and almost all obsolete bombers (Wellesleys, Vincents, Hartbees), to support their attack. The British launched their assault on November 6th, and at first it seemed to go smoothly. After a bombing attack and an impressive flourish of artillery fire (which caught some of the defenders by surprise), Gallabat was captured on the first rush, as the Indian Garwali battalion went in with bayonets, supported by the tanks firing point-blank at the defenses. The Italians fell back to Metemma, as planned, the only real resistance offered by some of the Italian machine gunners, who had to be silenced with hand grenades. A counterattack put in by two of the Italian colonial battalions with commendable speed and spirit was shot up and bloodied by the Garwalis, who also knew their business. But the British were not faring so well in the air. During the first attack, the combat patrol of “K” Flight’s three Gladiators were apparently caught watching the action on the ground, and jumped by some CR42’s. Two Gladiators were shot down, and the third shot up so badly it crash-landed, without Italian loss. At about 8:30 a.m. there was a dogfight between all six Gladiators of the South African squadron and eight CR42’s, which resulted in two more British fighters going down, again without loss to the Italians (one of the downed Gladiators was flown by the South African squadron commander, who bailed out, badly wounded, but later died of his wounds). At about 2:30 in the afternoon ten Ca-133 bombers escorted by an even stronger force of CR42’s appeared on the scene. The British threw all five of their remaining fighters, South African and British, in against them, and claimed two CR42’s shot down (I haven’t seen any mention of this on the Italian side so I’m not sure if the claims were valid) for the loss of one of their own Gladiators. But they could not prevent the Italian bombers from shaking out into a line and delivering their attack on Gallabat. Hardest hit was the single British battalion (which Slim had not wanted included in his 10th Indian Brigade– he trusted his well-trained Indian infantry much more). Slim himself (in “Unofficial History”) said that he never in his long career recalled seeing more ghastly wounds– severed limbs, scattered body parts, gore aplenty, etc. This was only the first of repeated Italian bombing attacks, as the enemy now clearly controlled the sky over the battle. Perhaps the most telling blow was the bomb which completely destroyed the truck bringing up the spare parts for the tanks. The British Essex battalion panicked and fled, driving wildly towards the rear in their vehicles, when another bomb struck an ammunition dump, with spectacular effect. Yet another visit by the bombers the following morning, just after dawn, caused many casualties among the Garwalis. It was obvious now that Slim’s attack had gone all wrong. In a little over a day he had lost nine of his dozen tanks, six of his ten fighter planes (a British report would note that the Italian fighter pilots had handled their aircraft “with dash and enterprise”– Tremaine, “The Right Of The Line”), and suffered 167 casualties, including 42 killed. A British bombing attack on November 20th, in Castagnola’s words, reduced Metemma to “a pile of rubble,” and left his own 27th Colonial Battalion “very badly knocked about” (”Haile Selassie’s War”). In two weeks the 4th Colonial Brigade was withdrawn again due to the losses it had suffered from the shelling and bombing. But despite the punishment they took, the Italians rightly regarded this little battle as their victory, and the British certainly considered it a defeat. General Slim was unceremoniously ushered out of the theatre, to enjoy success in the British invasion of Vichy French Syria, and then make his fame in Burma, Gallabat/Metemma a small and long-forgotten blemish on his World War II record. The battle for Keren would last a full 57 days, and during that time both sides were progressively reinforced. For the first time in the East African campaign the British would come to establish during this prolonged battle something like control of the skies, although the Italian airmen exhausted their remaining resources trying desperately to contest this. The Italians endured a near-constant shelling, to which was added, for more than half the battle, regular British air attacks. Eventually it came to be unnerving for the Italian forces subjected to this prolonged pounding, especially the Eritrean and Shoan native units, who were also bombarded with propaganda leaflets carrying the Emporer Haile Selassie’s own seal. By March about 600 askari, affected by all the above, had deserted to the enemy. The air war was now swinging definitely in favor of the British (despite occasional Italian successes like an air raid against the enemy field at Agordat which destroyed 13 RAF planes on the ground). Attrition was wearing away the Italian air units (I mentioned earlier that their top fighter ace in the theatre, Captain Visentini, was killed during the battle, trying to fly a mission despite bad weather on February 11th). By mid-March, when the next round of heavy fighting commenced, there were barely fifty operational aircraft left to the Italians, despite reinforcements flown in from Libya (the big SM82 transports managed during the East African campaign to deliver to the theatre 51 additional CR42 fighters, which could be carried inside the fuselage with their wings removed and stowed alongside). The second round of heavy fighting at Keren began on March 15th, 1941, a day of threatening thunderstorms which were soon drowned out by the man-made thunder above and below. The sun was just rising as the British bombers went in– ancient Wellesleys and Hartbees still flying along the more modern Blenheims. Then came the expected massive artillery barrages. By now the Italian air force had been almost completely swept from the sky. Nasi and his encircled forces in southern Beghemder were Africa Orientale Italiana, or all that was left of it. They would continue to hold out for some time. There was even a tiny remnant of an Italian Air Force, though by October they were down to a total strength of two operational CR42’s. The last air mission of the Regia Aeronautica in East Africa was flown on October 24th, 1941. The Italian airmen had planned to go down fighting all along, husbanding their last two planes for a final attack on a South African airfield from which the enemy aviation had been harassing them. But before the mission could be launched, one of the CR42’s fell victim on the ground to an Allied air raid. Nonetheless, on the 24th 2nd-Lieutenant Ildebrando Malavolta took off in his lone CR42 and headed for his date with destiny. Not surprisingly, he never came back, but later that day an Allied plane flew over the Italian airfield and dropped a note. It read: “Respects to the pilot of the Fiat. He was a brave man. (signed) The South African Air Force” And, indeed, they did cling to Gondar, to the rocky hills and mountainsides of Kulkaber and Wolkefit, until the bitter end. Not until November 18th did the last of Nasi’s men lay down their arms, and only then after a last bitter battle. 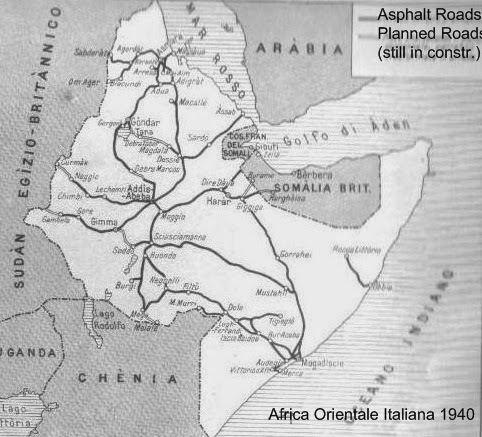 Including disputed areas of Eritrea (and not counting the period of the actual conquest), in the five years of inclusion in Africa Orientale Italiana Ethiopia was home to a maximum of about 300,000 Italian residents, of whom more than a third were soldiers or colonial administrators (in 1940 there were some 91,000 Italian military personnel in East Africa). The biggest Italian population center was Eritrea’s new capital in the mountains, Asmara, which had been built by the Italians virtually from scratch in the ’30’s (it was very much an Italian city in appearance, and has been described as “charmingly laid-out”). There were just over 49,000 Italians living there in 1939, and over 38,000 in Addis Ababa. No other Ethiopian city contained much more than a few thousand Italian residents (Jimma approx. 5,200, Harar 4,200, Diredawa 3,500, Gondar 2,000 in 1939, not counting military stationed there). For those who came to make their fortunes as laborers and entrepreneurs in Italy’s “new frontier,” one of the most lucrative businesses was in trucking, and many self-employed small proprietors, who could afford the price of a vehicle, made surprisingly good money in the transport trade in the new colony. The end of the Italian empire on the Amba Alagi last stand: the remaining Italians were granted the "honours of war". 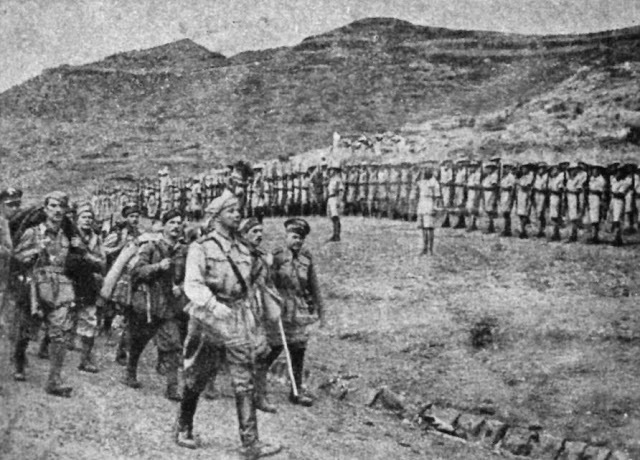 A guard of honour consisting of representative sub-units from all British units presented arms to them. Many history books I’ve read in my lifetime -that briefly dismiss the campaign in East Africa as another “easy” British victory over the Italians- aren’t even close to getting it right. Yes, the main part of the Allied offensive was over in three or four months. Yes, large numbers of Italian prisoners were taken. And, admittedly, the portion of the campaign dealing with Cunningham’s attack on Somalia were pretty embarrassing from the Italian point of view. But my reason in elaborating the rest of the campaign in such detail is to demonstrate that the actions in this theatre, considered as a whole, were far from a walk-over, and for a long time the Italians in many parts of the vast expanse of East Africa gave the forces of the British Commonwealth all they could handle (and fought bravely to the end).